Wednesday April 17th 1901 I was busy most of the forenoon varnishing furniture in the parlor, while Ida did the other work. In the afternoon we worked in the garret, got it half done. Thursday April 18th 1901 We finished the garret this morning and I put the parlor to rights. We raked yard in the afternoon. Friday April 19th 1901 We did some work in the yard early this morning Father and Mother were out for dinner. Mother stayed till about two oclock and I rode down with her when Will went in with the butter. weather cold for the time of year. The boys finished putting in oats today. 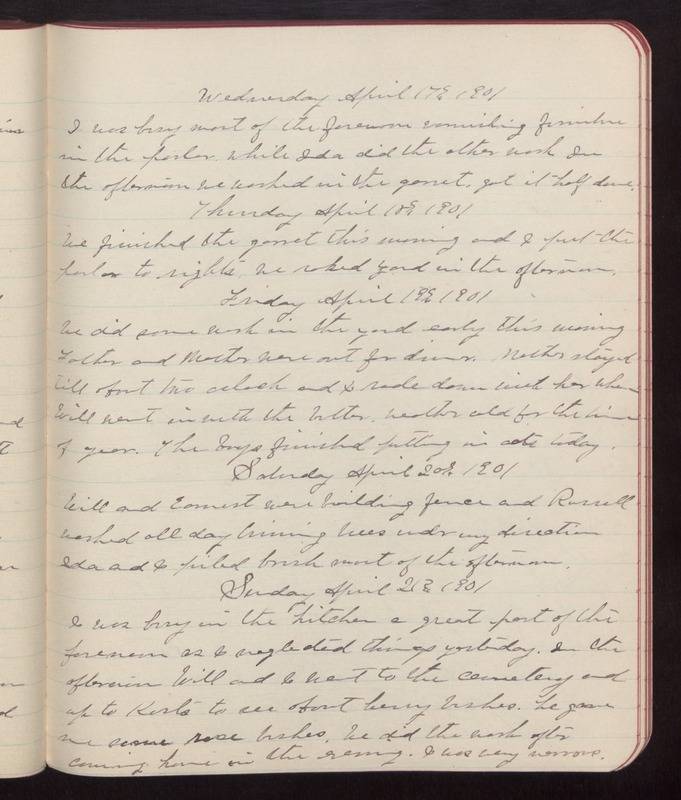 Saturday April 20th 1901 Will and Earnest were building fence and Russell worked all day triming trees under my direction Ida and I piled brush most of the afternoon. Sunday April 21st 1901 I was busy in the kitchen a great part of the forenoon as I neglected things yesterday. In the afternoon Will and I went to the cemetery and up to Kurts to see about berry bushes. he gave me some rose bushes. We did the work after coming home in the evening. I was very nervous.